I cannot think of any archetypal image that is more symbolic of freedom than a bird flying. But as I read about Jonathan’s plights, I realize that even a bird, a seagull, in Jonathan’s case, has limits. As humans, we are, in Heideggerian idiom, “thrown” into our world without choice. We are here, and in our everydayness, as humans, we have a real dilemma—we are bound by mortal limits, and yet, simultaneously desire to surpass them. We want to become our potentials. This is Jonathan’s story. Although able to fly, he confronts this very same predicament. There are two themes in Jonathan Livingston Seagull’s story that resonate very loudly as I read about his life. It is my own story too. The narrative embraces the paradoxical nature of feeling “trapped” by one’s limits while finding meaning and freedom in exceeding them. In this pursuit, through perseverance and remaining true to one’s unique self, one finds oneself—and ultimately is free. Much like Jonathan, I feel encumbered by my limitations and basically live my human life exploring new ways to exceed my limits, reach my potentials, and feel free. Jonathan wants to fly higher and faster than his fellow “flock” members, which leaves him quite vulnerable to criticism and feeling misunderstood. His fellow seagulls fly for food; their flying is sheer survival—they fly to eat. Jonathan flies for the pure experience of flying, and because of this “calling,” he is ostracized by his flock; they don’t understand Jonathan’s need to fly as high and as fast as he can, for pure pleasure. Jonathan refuses to conform, albeit not an easy stance at first, but eventually other seagulls become fascinated with Jonathan’s endeavors. Jonathan struggles to be himself. 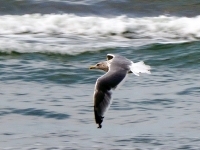 It also means going against the grain of his seagull nature to fly for survival. In his flights, he finds himself. He flies high. He flies fast. He surpasses what the other seagulls thought possible. He pushes past his seagull-limits. He finds truth and freedom. He courageously separates from the flock to pursue his urges, his desires, his calling—that which defines his very being. Just as Jonathan finds authenticity and freedom through the unadulterated experience of flying, we as humans have potential for the same. We can reach untainted experiential freedom, by living in the moment as it is—without contemplation. Here we find the possibility of freedom—of just being—living as our authentic self. We are our true nature. We are one and whole. Eventually Jonathan dies in his flight. One might argue that by ignoring his seagull limits, Jonathan finds his demise. I don’t agree. All beings die. Jonathan—a seagull—died because he, like we humans, was mortal. Prior to his death, Jonathan found the truth about life. He found pleasure in pure experience. He took himself past his natural limits. He separated from the flock in pursuit of his truth as his real authentic self and nature. Jonathan lived. That’s how I experience Jonathan’s character and all that his story has offered me. Jonathan is the inspiring and aspiring being that we as humans have the potential to be. I may never fly—in the bird sort of way. But I do have wings.